Bismillahi was salaatu was salaamu ‘ala Rasoolillah. We have separated restarting scheduled and unscheduled revision to allow revising scheduled and unscheduled surahs at different pace. 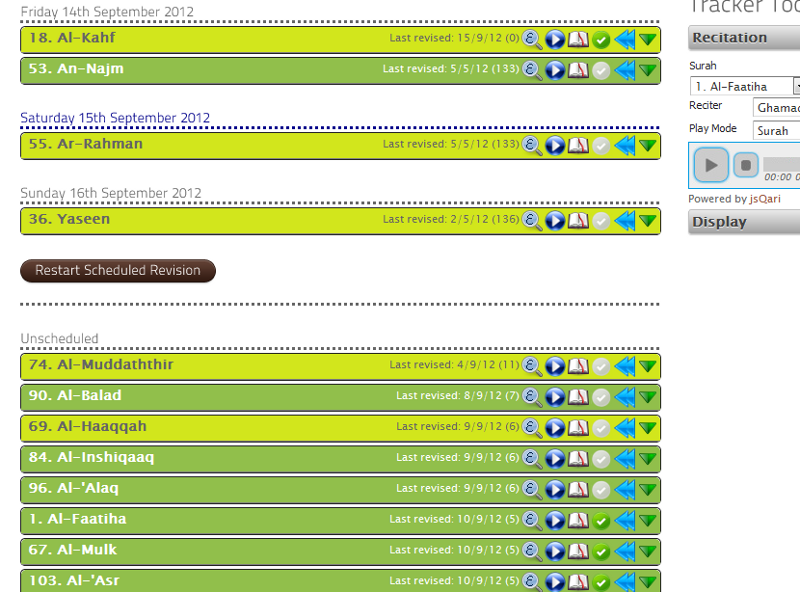 Before this update when you restarted your revision, it would reset all your revision surahs for revising. But now you can restart your scheduled revision surahs only and restart your unscheduled surahs only and set a different pace for each set. This allows you to take two very different approaches for the two sets. Scheduled revision allows you to set a very structured and rigid schedule for revising surahs. This is most useful for recently memorised surahs that need to be revised regularly and without too much of a gap to ensure that you don’t start to forget them. For these surahs you may have to sit down with your mushaf and revise them. On the other hand surahs that you have memorised some time ago and know quite well may not require such a rigid schedule. As long as you revise them on a fairly regular basis then they will remain inshaa Allah. You may take a more casual (for want of a better word) approach to revising these surahs such as reciting them in your salah, reciting them while you are travelling on the train etc. In the Revision Tracker you will now find a ‘Restart Scheduled Revision’ button at the bottom of your scheduled revision list and a ‘Restart Unscheduled Revision’ button at the bottom of your unscheduled revision list. So now you can revise your scheduled surahs in a weekly cycle (for example) but take longer (or shorter) with the unscheduled surahs and can restart them separately. Also the unscheduled surahs appear in order of when they were last revised with the most recently revised surahs at the bottom and the surahs that have not been revised the longest at the top. So surahs that need revising the soonest ‘float’ to the top! Separate button for restarting your scheduled revision surahs only and another button (not shown in image) for restarting your unscheduled revision surahs only. Also most recently revised unscheduled surahs go to the top and the ones that haven’t been revised the longest float to the top. The ‘Restart Revision’ button is still there if you want to restart both your scheduled and unscheduled revision at the same time. We pray that this new feature allows you to manage your revision more effectively. Please do let us know your feedback inshaa Allah. Posted on 15 September 2012, in General, System update and tagged revision, scheduled, unscheduled. Bookmark the permalink. Leave a comment.